Are you confident in your coverage? Get a free personal analysis today. FBN℠ now offers the full suite of federally subsidized crop insurance products, as well as private products like hail and wind protection. Our team of experienced agents is located in communities across the country. Are you an insurance agent? Join us. You shouldn't have to re-learn the language of insurance every year. Our agents and tools provide straightforward solutions and walk you through how they got there. Don't just follow your neighbors - get the coverage that's best for YOUR operation. With our agents you get experience backed by the power of FBN Data. 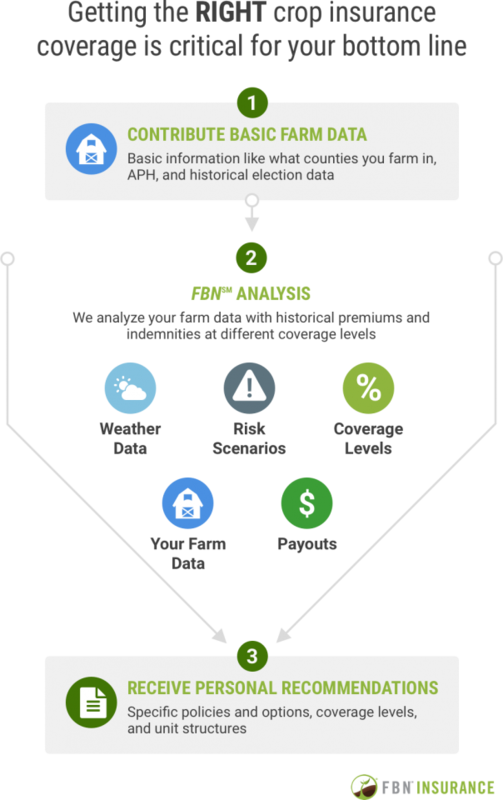 We look at historical coverage data and operational data to help you make the best decisions for your farm's unique risk profile. The right risk mitigation plan year after year can make a big difference. That's why we're moving towards a fully integrated approach that keeps you secure in down years, without dragging on your profits when times are good. We are an Equal Opportunity Provider. FBN Crop Insurance is only available in states where FBN Insurance is licensed to operate. FBN membership not required. FBN Insurance services are offered by FBN Insurance LLC (dba FBN Insurance Solutions Services LLC in Texas, and FBN Insurance Solutions LLC in California and Michigan) and are only available where FBN Insurance LLC is licensed. FBN membership is not required to purchase through FBN Insurance. FBN Insurance is currently offered in the following states: AR, CA, IA, IL, IN, KS, MI, MN, MO, MS, MT, ND, NE, OH, OK, OR, SD, TX, WA, WI. Copyright © 2014 - 2019 Farmer's Business Network, Inc. All rights Reserved. "Farmers Business Network," "FBN," and "Farmers First" are registered service marks of Farmer's Business Network, Inc.
We are an Equal Opportunity Provider. FBN Insurance services are offered by FBN Insurance LLC (dba FBN Insurance Solution Services LLC in Texas, and FBN Insurance Solutions LLC in California and Michigan) and are only available where FBN Insurance LLC is licensed. FBN membership is not required to purchase through FBN Insurance. FBN Insurance is currently offered in the following states: AR, CA, IA, ID, IL, IN, KS, MI, MN, MO, MS, MT, ND, NE, OH, OK, OR, SD, TX, WA, WI.